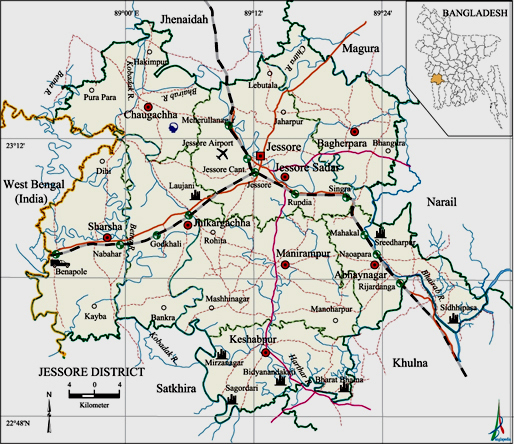 Jessore is one of the largest towns of the country situated in the southwestern region of Bangladesh. 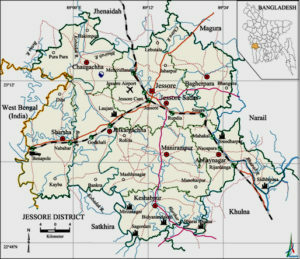 It is bordered by Khulna and Satkhira District to the south; Magura and Narail to the east; Jhenaidah to the north and West Bengal, India to the west. The district produces varieties of agricultural crops round the year including vegetables, flowers, date fruits, rice etc. Jessore became also famous for producing a wide range of fish seeds all the year round including seeds of common species (e.g. rui, katla, mrigal, bata, exotic carps, catfishes, tilapia etc.) and non-conventional species (e.g. shing, magur, gulsha tengra, pabda etc.). Important fish hatcheries in Jessore district are listed in this article. I think that this information will be helpful to all fish growers of Bangladesh and also other stakeholders. Visited 2,511 times, 3 visits today | Have any fisheries relevant question?